Every website has an “About Me” page. Your About Me page can be just another page on your website, or it can be a powerful sales machine. Which of those two options sounds better? The About Me page is also where the personal brand can really be communicated. A personal brand is easier than it sounds, simply because you are your brand. First let’s talk about what an About Me page is. It is a page on a website that allows the person or business to explain who they are, what they do, and why they do it. An About Me page can also be titled “About Us”, “Meet Us”, simply “About”, or any other alternative that gets the point across. You can see an example of an About Me page by checking out Agent Sidekick’s that we have called About Us. According to Moz, which is a SEO consulting company, the About Me/Us page is typically the most visited page on a website. Don’t waste the opportunity to prove yourself on the page that is just about guaranteed to be seen. Use it as a powerful sales machine. Even though the “About Me” page is technically about you, the focus of the “About Me” page should be about the reader. The tone should be that you understand and are empathetic to the reader’s needs. Although they want to read about you (because they clicked on that page), they really want to know how you will be able to help them. Give an introduction of you as an individual. Write it in a way that allows you to relate to the area, your specialties, and why you are a Realtor. Make this section of your About Me page personal. People want to learn something about you, but not so much that they get bored. This helps you humanize your website. Paint a picture for the reader of you enjoying the towns you serve, and how your experience gave you the knowledge they are looking for in a Realtor. People want to know that you know the areas you serve better than they do. Prove it. List the communities that you serve and why you serve them. Include links to those community pages. Explain your philosophy toward helping the home buyer or seller. Don’t believe in politics, religion, or anything else polarizing. The exception would be if those polarizing topics are part of your brand, and you don’t mind alienating half the population. Talk about your skills, especially those that set you apart from other Realtors. Examples can include interior design background, construction background, special negotiating skills, staging for sellers, investing in real estate, etc. Some people have more general skills that help them with specific tasks. Such as you are good at math, making you a master at running all the necessary numbers for your clients. Or maybe you are good at writing, resulting in you writing the best listing copy of any agent in your community. Your skills should be explained in context. “I am the best Realtor”, or “I will work harder for you than any other Realtor”. Those are hollow, every Realtor can say it, there is no way to prove it, and no lead believes it or cares. Don’t just list your skills. Dedicate a short 2 to 3 sentence paragraph for each with context. The examples listed above are just the first sentence for each of those paragraphs. What are the types of services you specialize in? It’s a turn-off when Realtors say “I can help any type of client with any type of transaction”. For example: If you have great experience with Victorian homes, because you have renovated two of them and know exactly what to look for in that architecture style of the period, then explain that experience. Another example: If you have great experience helping people relocate because you know how the quality of the neighborhoods change street to street, the best ways to commute, and can guide them through all the services they need to connect including the process for getting a new driver’s license and car registration, then explain those experiences. Don’t worry that you will be pigeon-holed into just those types of homes with those types of clients. You can almost guarantee that you will get all the business for those segments. Additionally, you will also get people who understand that those special skills translate to their needs as well. Speak to the reader to give them confidence that you will be able to help them. Tell them your promise to them. This is also your brand identity. Your entire About Me was the build up to this point. Every step culminated to this point where you get to summarize your brand. You don’t need to be creative, and you don’t need to make it complicated. This is now your opportunity to tie it all together. Thank them for visiting your website. Ask them to please contact you to discuss how you can help them with their real estate needs. There are two ways that an About Me page is used with two very different results. Most often people use this page to simply say something about themselves and the website, which usually get the “oh, that’s nice” reaction. 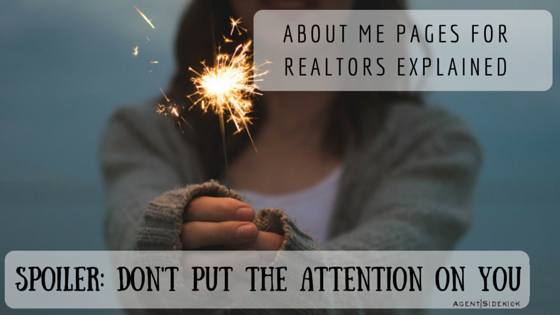 Effective websites, like yours, use the “About Me” page as an opportunity to sell the Realtor to the reader. You now have the structure of an About Me page that will sell you, your services, and your brand. Your website visitors will have no other choice but to use you as their Realtor. If you are interested in getting a website with an About Me page that gets you leads, then Agent Sidekick can help. Please contact us to let us know your needs.